We continue with our reviews of the 1More range of in-ear headphones. When talking value for money, bang for the buck and just generally pound for pound performance against the competition 1More are incredibly hard to beat. We reviewed the outstanding 1More Quad Driver and the 1More Triple driver. Both of those were traditional style earbuds but these new noise-canceling earphones are more than just a little different. This in no way is a gripe against 1More this is squarely aimed at Apple. Without a doubt, the worst thing in Audio in years has been Apple's removal of the headphone jack. I know it becomes totally cliched to bash this decision but it really does need to be reiterated in when reviewing a set of lightning headphones in hope that it drives the point home to apple. Right now I use 3 apple devices, an iPhone 8, MacBook Pro and Ipad Pro. If I have these earphones with me and want to use them with the MacBook I need to bring an adapter anyway. If I want to use the iPad pro then I need to use an adapter if I want to charge at the same time. Honestly, the whole system is a fragmented mess. Ok, so some of you will be here because you want a set of lightning cable headphones and don't want to use an adapter. I get that and I admit that using the 1More just with my iPhone has been a seamless experience. No messing about with those overpriced adapters is quite nice. The truth is that whilst a lot of companies may have hinted at making headphones and earphones with a lightning jack very few have actually followed through. Audeze is the one company that took the ball and ran with it whilst other big name brands have only dipped a toe in the water. Choices are pretty limited and standards, from what I have tested in the past, are pretty low. Enough Already! Can we just get to the 1MORE Dual ANC Review? Ok calm down and let's get into it. The feature set on these earphones is pretty impressive. 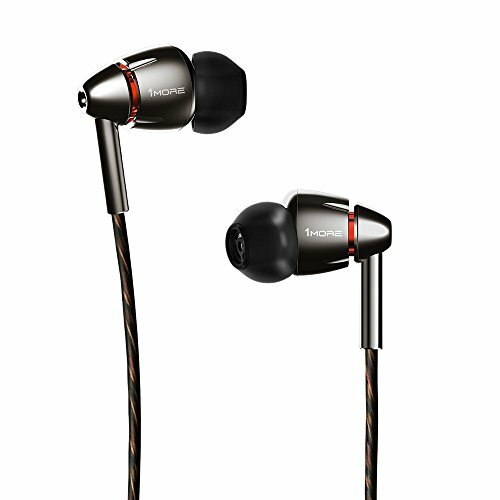 It's a hybrid earphone containing both balanced armature tweeter for the highs and a separate dynamic driver for the lows and mids. The units standout feature is the integrated ANC (Active Noise Cancelling technology) and multi-directional control button. As you probably guessed by now the Dual ANC are terminated in an apple lightning connector as opposed to a standard 3.5mm headphone jack. They are a traditional barrel style earphone that is designed to be worn with the cable down as opposed to being used over the top of the ear. Build quality is excellent throughout, something we have come to expect from 1More after having reviewed both the companies Triple Driver and Quad Driver earphones. The driver housings are made from solid metal which will add long-term durability to the unit and the nozzles and filters are also very well made. As I mentioned you are meant to wear the ANC with the cable down so it’s important that a good cable is included to reduce microphonics. We’re happy to report that the cable is excellent. It's 2 material design (cord and rubber sheathing) that is both tangle resistant and low on noise transfer. There is, as you would expect, an inline remote that can give you playback and call controls as well as access to Siri. Without cracking open the headphones one would also assume that this is where the noise cancellation unit is housed. Inside the remote also sits another one of the Dual ANC's features. They have their own 24 bit DAC unit which will bypass the rather mediocre one that sits inside the iPhone 7. Potential benefits of using an external DAC are a reduction in both background noise and signal interference. The Dual ANC is a rather large set of earphones with quite a large bore width. This makes them hard to recommend for people with small ears. Myself, I have a pretty average sized ear and had no problems with these IEM's other than the fact that they feel a bit heavy and are not my preferred style. I should also mention that the included rubber flanges that are designed to keep the earphones securely in place are excellent. Very comfortable and do exactly what they are meant to do. It was almost impossible for me to achieve a seal with my ear canal, this took a lot of work and even then slight movements would shift them out. Isolation was just ok. Mainly due to the ANC technology which whilst not the best does do an ok job of reducing consistent external noises. I took them on 2 short flights to Germany and I am not too sure that they offer a significant reduction in external volume than a good set of noise isolating earphones. Obviously, they don't come close to the class-leading Bose QC35 or Fiil DIva Pro but for a set of in-ear headphones, they are OK. Certain frequencies are reduced slightly although they are not eliminated and they don't offer much in the way of reduction to non-consistent noise like people speaking or moving around and for consistent noises it's a slight reduction. Honestly sound quality won't blow your socks off but that is more to do with the fact that they use noise cancellation than anything else. Noise canceling headphones have a certain quality to them that affects the sound. There is a sort of sucked out drawn feeling and so far only Bose has come close to removing it on their full-size models. So in that regard, it's unfair to compare the sound quality to that of regular non-ANC earbuds. Against other noise canceling earphones they hold up quite well and offer a similar performance to the Audio-Technica ATH-ANC33IS and the like. When buying a set of headphones with ANC then that should be the focus as opposed out and out fidelity. What you do get is an inoffensive sound that is clear and competent in recreating the music. Bass is punchy, mids are laid back and the treble has a few peaks that border on sibilance. Honestly though just know that the Dual ANC sound ok but it's not jaw dropping compared to non-ANC earbuds but it is on par with similar noise canceling in ears. If you are looking for a set of noise canceling earphones with a built-in lighting cable then you should consider the 1More Dual Driver ANC. If noise cancellation and in-built lightning cable is not a priority to you though, the answer is a definite no. There will be lots of better option available to you, many of them coming from 1more themselves. For example, if you wanted way better style and way better sound then get the 1More Triple driver (which are also available with the lightning connector) or pay a bit more and grab the outstanding Quad Drivers. These are definitely a niche headphone that is designed to cater to a very specific buyer. There are plenty of earphones out there that both look and sound better for a similar price, However, there are none that I can think of that has a built-in DAC, ANC, inline controls and a lightning connector all in the one package. If that's your thing then you should definitely consider them but I don't know if the DAC offers any significant improvement over the one in the iPhone or if the noise cancelation offers advantage over a good set of noise isolating earphones. As a feat of technology, they seem to tick all the right boxes but I still find it hard to be moved by them. Housing for the 1More ANC earbuds.